The Agormanya Area Head of The Church of Pentecost, Apostle James Gabriel Quardson, on Sunday, June 17, 2018, dedicated the Akateng Central church building in the Akateng District. He was assisted by the Akateng District Minister, Overseer Abrahams Harvoh. Reading the brief history of the Assembly, Elder Teye Kpiti stated that the church, which began in 1986 with 28 members, constructed a church building in 2001 only for the building to collapse ten years later. Attempts to renovate the building proved futile hence the need to construct a new church building. Consequently, the sod cutting and foundation-stone laying ceremonies for the building project were performed by Apostle Joseph K. Assabil and Apostle Jacob Narh Affum on March 29, 2013, and February 3, 2015, respectively. 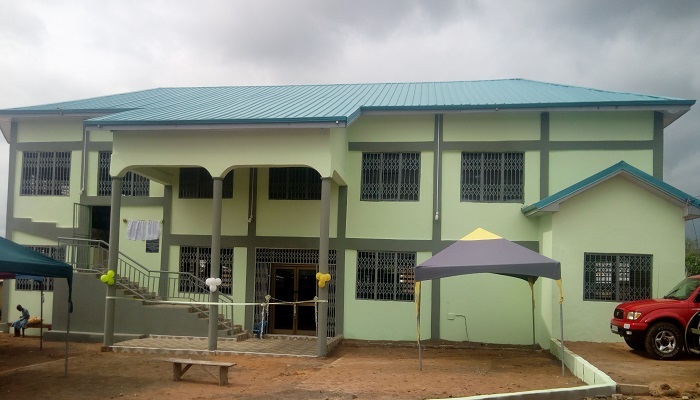 With a significant support from the Church’s Head Office and the Agormanya Area in addition to its Local Development Fund, offerings by members and donations from other benevolent individuals, the leadership of the Church was able to complete the project at a total cost of GH¢325,881.76. Speaking on the topic “Faith and Works Are Part Of The Basic Message” at the dedication ceremony, Pastor Hayford Alfred Nartey of Akrade District admonished the gathering to exercise faith in Jesus Christ since He is the only one who has been accredited to save humanity. Pastor Nartey indicated that every act of service demonstrated by Christians in line with the gospel is very important before God. Touching on the importance of church buildings, the Akrade District Minister said that church buildings help the stewards of God to organize and teach the word of God to the souls won in a conducive environment. Elaborating on 1 Corinthians15:58, he admonished all and sundry to continue with the good works they are doing for Lord, adding “our labour shall not be in vain”. He also called on Christians to live righteous lives for Christ, imitate His examples, establish good human relations with others, live peacefully with their neighbours, and support the Church with their resources. ”Let your faith be backed with works and be involved in helping to develop the physical aspect of the Church,” he noted. Commenting on the Community Based Church Building (CBCB) initiative of The Church of Pentecost, Headquarters, he thanked the leadership of the Church for this noble initiative and indicated that it has helped to eradicate churches under trees. This, according to him has brought about progress and improvement in the Church as a whole. After the exhortation, Apostle Quardson led the gathering to pray for the Church, the nations as well as all government officials. Present at the event were: Honorable Felix Nartey (District Chief Executive, Upper Krobo District Assembly), Dade Matse Lawyer Terkper (Chief of Akateng), Mrs Felicia Quardson (Wife of Agormanya Area Head) as well as the Agormanya Area pastorate and their wives.